Fifty years after Sir Winston Churchill heralded from the podium at Westminster College the descent of an "Iron Curtain" across Europe, another former British prime minister paid tribute to his legacy. 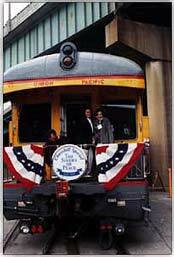 The celebration had begun Thursday evening, March 7, with a vintage train provided by Union Pacific that retraced the route Churchill took from St. Louis to Jefferson City, Missouri. On Friday, March 8, a symposium sponsored by the College and the International Churchill Society was held in Jefferson City, capped off by a reception and black-tie dinner in the state Capitol Rotunda. Mimicking the 1946 festivities, the next morning began with a motorcade parade through Fulton that retraced the route of Churchill and Truman and continued with a public luncheon of country ham and fried chicken, the same meal Churchill ate. 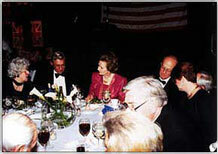 After Thatcher's afternoon lecture, an evening black-tie dinner was held in the gymnasium where Churchill had spoken, and the weekend events concluded with a special worship service Sunday morning in the Church of St. Mary the Virgin, Aldermanbury. There were, of course, inevitable minor differences after 50 years. The weather was 35 degrees colder than it was in 1946; Lady Thatcher arrived by plane, not train; and, unlike Churchill, she didn't play poker on the train because, as she said in her speech, she didn't "have the right kind of face for it." The Green Lecture ceremony attempted to replicate the 1946 event and began with a prelude by the Missouri River Brass Quintet, the traditional "How Firm a Foundation" as the processional and the Call to Order by Dr. John Schultz, '58, marshall of the College. After the Westminster College Chamber Singers sang the national anthems of both countries, the "Star Spangled Banner" and "God Save the Queen," the Rev. Dr. J. Layton Mauze III, '59, pastor of the First Presbyterian Church in Fort Smith, Ark., gave the invocation, and President James F. Traer welcomed the audience to the College and introduced distinguished guests. After greetings from John W. Marsh, '49, chairman of the Board of Trustees; Marvin O. Young, '51, senior fellow of the Association of Churchill Fellows; Dr. Walter B. Roettger, dean of faculty and vice president; and Kyle C. Goggin, '97, president of the student body, the Chamber Singers sang the "Battle Hymn of the Republic" as an anthem. 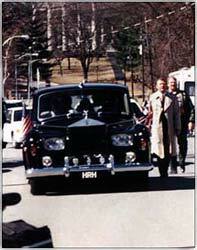 Then President Traer presented Missouri Governor Mel Carnahan, who in turn introduced Lady Thatcher. 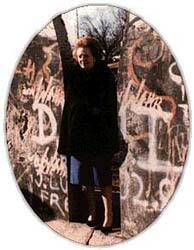 Thatcher's speech did not seem to contain a catch-phrase that would live forever, such as the "Iron Curtain" line, but historians on an expert panel after her lecture pointed out that journalists and the public didn't recognize the significance of Churchill's speech, or the "Iron Curtain" line, until much later. Lady Thatcher sounded a strong alarm against the revival of a Russian foreign policy that would be less friendly to the United States, and she decried the proliferation of weapons of mass destruction in the hands of "rogue states" which she called the "single most awesome threat of modern times." After her speech and a citation of her by The Hon. Robert J. 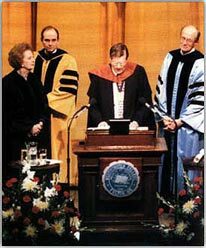 Chase, Her Majesty's Consul General, the College conferred an honorary degree upon Lady Thatcher, and Karl E. Hedlund, '94, sang the solo, "Recessional." The Chamber Singers then sang the Alma Mater, the Rev. Frank C. Ehman Jr., pastor of First Presbyterian Church in Fulton, Missouri, gave the benediction, and Julia Mathews, College organist, played the recessional, "Love Divine All Loves Excelling." 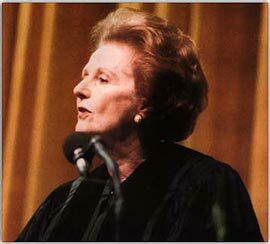 No one can predict what impact Thatcher's speech will have, or whether its effect on history will rival Churchill's. Nevertheless, the excitement surrounding her day in Fulton marked another chapter in the history of important speeches at Westminster, and the event's historical symmetry represented the world's effort in the l990s to understand the international challenges of the future after five decades of bipolar struggle.